You need to have a valid Learner’s Licence before you can start learning to drive. In order to get a Learner’s Licence, you need to pass a theory test which covers Rules of the Road, Road Signs and Markings, and Vehicle Controls. Check out our Theory Test Page for more information. For a Motorcycle Learner’s Licence you need to be 16 years old; for a Light Motor Vehicle Learner’s Licence you need to be 17 years old; for all other Motor Vehicles plus larger engine Motorcycles you need to be 18 years old. A parent, friend or older sibling (they need to hold a valid driver’s licence) are probably able to teach you the basics of driving. However, they might not know the K53 method of driving, and it is essential to be comfortable with that method of driving in order to pass your driving test. A certified instructor will be able to teach you the K53 way of driving, and help greatly increase your chances of passing. How many hours of driving lessons are generally required for someone who has never driven before to learn to drive and get ready for the test? It depends on the person – their confidence, ability and willingness to learn, and aptitude for driving will all play a part. It can take anywhere from 10 to 20 hours’ worth of driving lessons. The number of lessons can be reduced if a learner has access to a car for practice outside of lessons. It is also important to pick an instructor whose teaching style goes well with your learning style – you will learn better and potentially faster with someone who understands your needs. Doing a driving assessment lesson with an instructor will help them evaluate your driving skills, and they can then suggest how many hours of lessons you may need. How many weeks or months in advance of the test would you recommend starting lessons? It is never too early to start learning – tests are often booked anywhere between 2 and 3 months in advance (these are often the earliest available spots), which will give you plenty of time for practice. Is it recommended to start learning with a parent before attending lessons? Learning some basics, such as how the pedals work and basic clutch control, with a parent (they need to hold a valid driver’s licence) might be advantageous, but be careful of learning any “bad” driving habits that do not conform to the K53 way of driving. It can be very difficult to break these habits, and you don’t want to go into your test doing things the non-K53 way. If you would like to learn with a parent before attending lessons, you should look up the K53 driving method beforehand and make sure everything you do complies with it. You will have to pay attention to things like mirror checks, observation checks, how you steer, etc. Is it best to do some lessons first and then practise with a parent or friend? Having some lessons first is a great way of developing good K53 driving method habits. Once you are comfortable with this method, practising with a parent or friend (they need to hold a valid driver’s licence) can be beneficial, and it might save some money on lessons too. It is always best to have your instructor evaluate your driving style after practising with a parent or friend to make sure that you aren’t picking up any non-K53 driving habits. Which is better: an intense course of daily lessons or spreading lessons out weekly, allowing for more practice time in between? It depends on each learner’s learning style. What some learners find best is to start with spreading lessons out over each week, allowing for practice time in between lessons. As you get closer to the test, you can increase the frequency of lessons and get more intense practice with your instructor in. With regards to lesson lengths, driving on the road can usually be done in single hour blocks, whereas parking is better to do in 2 hour blocks. If you are on a tight budget, what do you recommend as a course of action for learning how to drive? This will depend on what resources you have available to you. 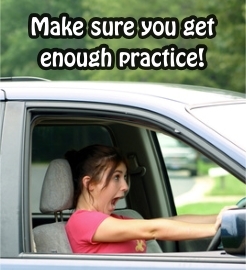 If you have a car and someone with a valid driver’s licence to accompany you, you can practise outside of lessons (a parent’s car, or maybe a friend’s), then you will be able to save money on lessons, as long as you are not developing any bad, non-K53 habits which will have to be unlearned during lessons. You can also save money by buying lessons in bulk – driving schools and instructors often offer bulk lessons at a discounted rate, which will be cheaper than buying lessons individually. What is the average cost of lessons in total for Learners when learning to drive? This will depend on how many lessons you require, which area you are in, and which code licence you are preparing for. For car lessons, lessons tend to cost between R130 and R200 a lesson. Driving schools or instructors often offer package deals however – for example, you can buy 10 lessons ahead for a discounted amount (cheaper than you would pay for 10 individual lessons). Speak to several instructors in your area about what payment options are available to you. You can work out the cost after an assessment lesson, which will help you to determine the number of lessons you may need. If you are practising with a parent, remember there are also fuel costs involved. For more information on the Driver’s Licence, check out our Driver’s Licence Info page.